If you are seeing this, then Javascipt is not turned on in your browser. Some aspects of this page will not work correctly. Poser content is a huge problem for a lot of us. Many of us with giant libraries need better tools than come with Poser or the new DAZ Studio. PRPC was created by tromnek to help solve this problem. It's pretty simple. A little server runs inside Poser and listens to network requests. Those requests cause it to load content into your Poser scene. This enables applications like Advanced Library and P3dO Explorer to work. Not being willing to give up Advanced Library just because I was using DAZ Studio and being generally unhappy with it's send keyboard commands I hacked up a DAZ Studio plugin that does what PRPC does for Poser. This is Windows only. The installer will install it into your DAZ Studio/plugins directory after you agree to the EULA. You may need to configure your firewall to allow DAZ Studio to accept network connections. You can uninstall it with Add/Remove programs or just by deleting the prpc.dll from the DAZ Studio\plugins\PontariPlugs directory. There is no security. By default only processes running on your local machine can access the server. But you can change this with the option panel if you would like to be able to control DAZ Studio by remote control. It's important to realize that this plugin does give the ability for processes on you local machine (or if you enable it, remote machines) to give commands to DAZ Studio. DAZ Studio's files are actually scripts that can do powerful actions. These features could be exploited, and with this plugin, executed remotely. If your network isn't sheltered by a router/nat/firewall this may be bad for you. There are two commands that should appear in your edit window. They are Start/Stop PRPC Server and PRPC Options. 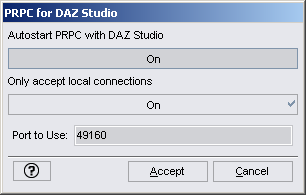 The option panel lets you set some options that control if PRPC starts with DAZ Studio as well as the network port to use and if traffic from outside your computer should be accepted. If you don't find these commands under your Edit menu you will need to add it to your menus with the Edit->Customize command. For help on how to do this click here. It reports its status in the DAZ Studio status bar. Once it's running the Start/Stop command will let you stop the server. 01/30/2011 3.0.0.2 Switched loading methods to use DAZ Studio 3.0's standard method for loading all content. This vastly improves compatibility with .dsb files and objects with script loaders. 07/17/2010 3.0.0.1 Finally decided to package and release an official DAZ Studio 3.x build with full installer. The new installer should handle 32-bit and 64-bit machines correctly (find your installation of Studio). This release also adds support for .dsa files. 06/21/2009 3.0.0.0 This is an alpha test build for DAZ Studio 3.0. 32 bit and 64 bit versions are included. It hasn't had a lot of testing and did require a near complete rewrite of the networking code due to changes in the Qt framework. The alpha build doesn't have an installer, you must copy the plugin by hand to your DAZ Studio plugins folder. See the read me included for more details. The older 2.x release is also still available for DAZ Studio 2.x users. 07/13/2008 1.0.0.5 This build is built against DAZ Studio 2.2 SDK and requires 2.2.2.20 or higher. It adds support for handling combination scripts with CR2/PP2 objects (like the subd-dragon) and a progress bar when loading DAZ Studio native content. Note the progress bar won't move but it will appear so you know something is happening. 01/05/2008 1.0.0.3 Added new option menu with control over auto-start, port, and blocking external connections. Changed menu to Start/Stop. 12/16/2007 1.0.0.1 .daz, .ds and .dsb files weren't being loaded correctly. ALPHA Test build for DAZ Studio 3.0. No installer.